is one of the largest higher learning institutions in Africa and the oldest higher educational institution in Ethiopia. AAU started its operation in 1950 under the name University College of Addis Ababa. It was renamed Haile Selassie I University in 1962 and then Addis Ababa University in 1975.
is an initiative developed within the framework of Centres of Excellence for Science and Technology in Africa. Hosted and managed by the International Livestock Research Institute (ILRI) in Nairobi, Kenya, the BecA Hub provides a common biosciences research platform, research-related services and capacity building opportunities to the region and beyond. BecA exists to increase access to affordable, world-class research facilities and to create and strengthen human resources in biosciences and related disciplines in Africa. was founded in 1951. Its mission is to encourage and support north-south research partners in West Africa, according to national and regional priorities. is the largest of the four universities in Berlin with around 40,000 students. Research at the university is focused on humanities and social sciences and on health and natural sciences. It was founded in 1948 by students and staff who were relegated from Humboldt University of Berlin because of their political views. 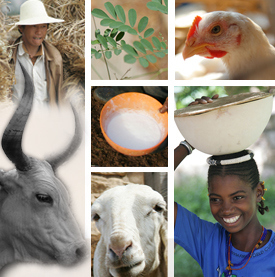 works with partners worldwide to support the role livestock play in pathways out of poverty. ILRI research products help people in developing countries enhance their livestock-dependent livelihoods, health and environments through better livestock systems, health, productivity and marketing. ILRI is a member of the CGIAR Consortium of 15 research centres working for a food secure future. ILRI has its headquarters in Nairobi, Kenya, a principal campus in Addis Ababa, Ethiopia, and other offices in southern and West Africa and South, Southeast and East Asia. is an institution working under jurisdiction of the Ministry of Agriculture of Mozambique (IIAM), with the overall objective to control animal disease and food borne disease. The activities are carried out in coordination with the National Directorate of Livestock (the national veterinary authority) and the Provincial Livestock Service through inspection services. is Uganda’s largest and second-oldest higher institution of learning, and was first established as a technical school in 1922. In 1963 it became the University of East Africa, offering courses leading to general degrees from the University of London. It became an independent national university in 1970 when the University of East Africa was split into three independent universities: University of Nairobi (Kenya), University of Dar es Salaam (Tanzania) and Makerere University. Today, Makerere University has 22 faculties, institutes and schools offering programmes for about 30,000 undergraduates and 3,000 postgraduates. is a private university in Ebetsu, Hokkaido, Japan, established in 1960. The predecessor of today’s college of Agriculture, Food and Environmental Sciences, a dairy juku, was founded in 1933 and includes the school of veterinary medicine with 140 vet and 60 animal technician students enrolled each year, a wildlife research center, the environmental science unit and Japan’s first veterinary epidemiology unit. began in 1964 as an agricultural college offering diploma in agriculture. It was elevated to a faculty of agriculture in 1969 and established as a university in 1984. It has three faculties: agriculture, forestry and veterinary medicine. is the oldest and largest of the five Ghanaian public universities. It was founded in 1948 as the University College of the Gold Coast, and gained full university status in 1961. It now has nearly 24,000 students and is mainly based at Legon, about twelve kilometres north-east of the centre of Accra. is the largest university in Kenya. Its history as an educational institution goes back to 1956, and it has been an independent university until 1970. It has around 30,000 enrolled students and six campus colleges including the College of Agriculture and Veterinary Sciences.